I don't know how much longer I will be able to maintain this BLOGGER website. My posting may be inaccessible without notice, and I may not be able to recover from BLOGGER's new Security System. ... well, let me explain. A woman in Memphis, Tennessee, is being credited with scaring a robber off her uncle's property after she grabbed her handgun. Nobody was injured in the (apparent) day-time home invasion, but it suggests that self-defense is better than 911. This picture is on the original article, but I've embedded it because it was just too good to risk having it "go away"
Florida to espouse States Rights v The Constitution? The NRA suing the Florida Legislature is like a parent suing the children. That’s Mom and Dad taking Johnny to court because he won’t eat his broccoli. Of course, the NRA picked as its target a patsy who probably won’t fight back too hard. It doesn’t have the guts to go after its real enemy, the courageous children of Parkland. The NRA, as a representative organization of sportsmen and other legal firearms owners, is unlikely to "go after its real enemy" identified by the Author as "courageous children". The NRA is all about civil and constitutional rights, and its members demand that it protect the First Amendment as assiduously as the Second Amendment. The very idea that this membership would continence an attack on patriotic teenagers ... even those who (wrongly) accuse the NRA of fomenting firearms violence ... is anathema. The author of this article has a private agenda, and has resorted to distortion of the truth and condemnation of strangers in an attempt to paint them with a bloody brush. In point of fact, the Federal Government does have the power to impose Constitutional Rights on states which have historically denied them. Witness SELMA ( do your homework), where President Dwight David Eisenhower sent troops into Alabama to protect the rights of African-American children to get the SAME educational opportunities as white children ... as opposed to the "Separate-but equal" sham (which was far from equal, but certainly separate) acts of southern states who tried to maintain their apartheid restrictions on many of their citizens. It's not about "GUTS", and the author is wrong (and knows he's wrong) to suggest it. The NRA's only enemies are those who would undermine or deny Constitutional Rights to its citizens. That's the reason for its existence, and the reason why over five million (that's 5,000,000 to those who are unfamiliar with, or don't understand the Bill of Rights) law-abiding American Citizens accept the National Rifle Association as their representatives in combating anti-constitutional laws at the local, state and national level. .... some ... a few ... many ... most ... all of the protesters were carrying firearms which may or may not have been loaded with live ammunition. Nobody asked, nobody told. And it didn't matter. It's illegal in Boulder to openly carry a firearm unless it's held in a "carrying case" — a holster for a handgun, for example, or something larger and easily recognizable in the case of a larger weapon. And, yet, on Saturday afternoon in downtown Boulder, some among the group that lined Broadway to rally in opposition to the City Council's proposed ban on assault weapons stood with AR-15-style rifles slung over their shoulders. City Attorney Tom Carr, who said the police did not intervene as open-carry laws were being broken because doing so might have escalated the situation. If you can't trust a man with a gun, you cannot trust anybody. 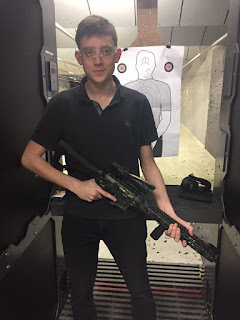 New "Civil Wrong": Going To A Shooting Range with your progeny! Apparently it's Anathema to teach your children to exercise their constitutional rights. Ken Bone, the man who became Internet famous for asking questions during one of the 2016 Presidential debates (and for wearing a now-iconic red pullover), says his son was suspended from school pending an investigation after Bone posted a photo of him and his son getting time in at the gun range. Nobody wants to take your guns away! But it's perfectly "OKAY!" to take away your child's Educational Rights if you have taught him/her how to safely and responsibly use a firearm. And by extension, there's something wrong with the Constitutional Rights of the Second Amendment. Support your Constitution; defend it against Liberals who are searching for ways to teach your children that your failure to support of the Second Amendment is license to abrogate all of their other civil rights. That's not just wrong ... it's Dead Wrong! "Most gun owners would not hold their gun in this same posed manner." Why Not? He's at a GUN RANGE! It's possible that the criticism is because the photo shows the young man at a shooting range, facing UP RANGE, and he is behind the line of fire. But there's no reason to believe that the firing line had not been cleared before the photo was taken. (c) the muzzle is not discernibly pointing "up-range". There's nothing "unacceptable" with his firearms safety procedures. NOTE: "Range Rules" not obviously violated. The Critic doesn't identify the "problem". In response to a photo that was taken of Kashuv, American History teacher Greg Pittman tweeted: "As a teacher from Stoneman Douglas, any student posting photos holding guns, knives or other weapons would be questioned. 4 federal cases have ruled in the last 10 years that assault weapons are not protected. Most gun owners would not hold their gun in this same posed manner." The quote's emphasis seems to suggest that the criticism concerns the validity of Student + Photo + Guns/Weapons = BAD! Any American who is not forbidden by virtue of insanity, felonious history, or certain other legal bans (include domestic violence ) is acknowledged by the Constitution to the right keep and bear arms. Age Limits may apply; parental discretion is a defense. I am not criticizing the author's opinion; it's only that he doesn't specify WHY he considers the subject's "Pose" to be unacceptable. Unless and until he clarifies his statement, we are left to conjecture ... which is often based on assumptions of our own. a federal judge has rejected a California law that was set to take effect to ban the ownership and possession of firearm magazines that hold more than 10 rounds. U.S. District Judge Roger Benitez said that people should be able to use firearms with “whatever common magazine size he or she judges best suits the situation”. A testimony to individual liberty I personally find refreshing. She may just be right. Republicans haven't fielded a respectable Presidential candidate for some time. A confident House Minority Leader Nancy Pelosi (D-CA) predicted on Tuesday that Democrats will take back the House and immediately push for amnesty for so-called Dreamers and more gun-control legislation. “When we win and we take over in January, some of the issues that will come up soon are some of the issues that we are asking the Speaker to do right now,” she said at a Georgetown University event. I suggest that Trey Gowdy would be the most electable Republican in America today. He is bright, articulate, and speaks to conservative views ... which Donald Trump (elected because the alternative was Hillary Clinton) cannot claim in good conscience. A Gowdy presidency .. he was not born with the most serious family name possible ... would offer a clear choice between himself and anyone the Democrats could offer. The most salient characteristic in the blog is, of course, that he's still "Not Hillary", but also that he is a constitutionalist. Shucks, if the too-shy Gowdy declines to run for President, I am probably not the only Conservative who is going to enter him as a "Write-in Candidate". Which would undermine the Republican voters (if Gowdy is not on the slate) and probably guarantee another four years of Democratic Party chicanery. Well, if that's what it takes to get a Presidential Candidate who offers a clear alternative to Democratic vote-buying, I can stomach another Democrat that I won't vote for ... ever. There is a "class" of people who think that the Constitution of the United States should be "rewritten" to recognize the values which have (in their mind) become preponderate in our country. The Second Amendment is at the top of their "hit list", because it subtly proposes that each American is responsible for his/her own safety and security. Men are responsible for their own self defense, as well as for the defense of their family, their peer group, their clan ... everyone for whom men feel a social connection in which every member supports every other member. In this situation, and in Modern America, men have accepted their responsibility by arming themselves and by practicing the skills which enable them to defend their. peer group. As for the confiscation of firearms, men deem the ownership of firearms to be required in a Free state: if we cannot defend our Family,, we are freeloaders who contribute nothing to Society. That's permissible, but it is not a "High Value" status in the clan: it's a "hanger-on" a person who is not competent, and is only accepted because his contribution adds to the social value, not the continuation, of the Clan. They choose to arbitrarily determine what actions we might take in our priority to survive, and their priorities are political rather than practical. They are typically not responsible for their own safety ... they hire guns, but do not carry them. "Those poople" usually have not been "shot at". They are very comfortable in their cocoon of inexperience. They glory in their supposed value ("Hey, I'm a STAR!) and the expense of hiring guards in off-set by the publicity value. You and I don't have any publicity value, and therefore we need to provide our own self-defence. I've been "shot at:. I didn't enjoy the experience and I take responsibility for my own personal well-being. But I was in a war zone, and I ws drafted. Michael Bloomberg Wants To Be Gun Czar? Anybody who listens to Michael Bloomberg is a damn fool. "I think all of us have a responsibility between now and then, call your congressman, call your senator, and say we want you to do something about this. I don't want to have my child at risk. I don't want to personally be at risk from crazy people with -- should, who shouldn't have guns," Bloomberg said. The crazy thing about "calling your congressman ...." and saying "..we want you to do something about this" (speaking of Gun Control legislature) is that your congress-critter has no better idea what to "Do About This" than does Bloomberg, who thinks crazy people are those who don't agree with him. Well ... except "Mister and Mrs America, Turn 'em All In!" Thanks ... I feel better now. But (CONFISCATION) is the only possible solution to the "Gun Control Problem". As long as one single private citizen has access to a firearm, the gun deaths will just keep rolling in. You know it's true; Nancy Pelosi said so! The solution is to make guns illegal. That way nobody will ever get shot again. Except that the people who turn in their guns will have no defense against criminals, who have this evil smirk on their faces, hoping that civilians will voluntarily render themselves defenseless against predation. Because criminals don't NEED guns to assault the weaker members of our society ... such as old people, like me. Guns just make their jobs so much easier, as long as they are the "Only Ones" who have guns. So if you give up your guns ... well, you do the math. The guns will be melted down, Ford will buy the slag and build 10 million cars that nobody wants, and you will be unable to outrun a bullet from the guy who carjacks your Ford Fiesta. Because for DAMN sure, he didn't give up HIS gun! (Except why anyone wants to own a Ford Fiesta I'll never know ... do they even make them any more? Here's where Nancy Pelosi's advice becomes useful: "Mr and Mrs America, Give Up Your Ford Fiestas ... Give 'Em All Up!" (If gun control works, wait until the Liberals follow up with "Knife Control"! Portland mayor tells student rally he'll seek city-wide 'assault weapon' ban: Though Wheeler may want city leaders to act tough on guns, state firearm preemption laws forbid local governments from regulating the “sale, acquisition, transfer, ownership, possession, storage, transportation or use” of guns in any way. But the former Oregon State Treasurer and political ally of Gov. Kate Brown said he is going to work on that as well. “I am going to Salem during this next legislative session and I’m going to ask the Governor and the legislature to lift the preemption in Oregon,” Wheeler said. Some people will go to extravagant ends to justify their theories, even at the risk of allowing themselves to be identified as fools. You have to ask yourself, what does this have to do with "Gun Control"? In 1963, Britain experienced 5,714 suicides. Over the next several years, that number declined steadily and quickly; by 1975, the country had 3,693 suicides. This decline took place against a rise in suicides throughout the rest of Europe. Social scientists started looking for something to explain the drop. What they realized was that the decrease in suicide had coincided with the progressive transition in British households from carbon monoxide-producing coal gas to natural gas, beginning in 1958. First, the title of the article suggests that the topic is "School Violence" .. but the dominant text seems to address British Suicides! The rest of the article seems to be on track with the "British Suicide" theme, but it doesn't lead into the title topic: "Gun control ... will really stop school violence". Another Clarke and Mayhew study, for example, found that thefts of motorcycles dropped as much as 60% in Germany after a law was implemented requiring motorcyclists to wear helmets. Because these thefts tended to be crimes of opportunity rather than planned heists, potential thieves were dissuaded from stealing motorcycles due to the increased likelihood of getting caught if they were pulled over for not wearing a helmet. What the heck? We bounced from Suicide, to Gun Control, with a short stop-0ver at Columbine! And now we're talking about motorcycle Theft? And safety helmet laws? Am I the only one who can't keep track of the theme of this screed? Finally, the author decided that the cause-and-effect relationship was determined by ... what was it again? Oh, yeah, right: carbon monoxide poisoning from Coal Gas. British humor: we "Amies" can't always tell whether they're "having us on" or ... what? Minnesota HF3022: The Face of the Future? Funny thing; I always thought the law was intended to protect the innocent and our Human Rights. Today, we see states deliberately formulating laws to make criminals of law-abiding citizens, and undermining Constitutional Rights. It's a funny world we live in, isn't it? But not humorous; no, not at all. HF 3022 could make California seem "gun-friendly." If you live in Minnesota, be afraid. Be very afraid. Then get busy. Universal Registration of all firearms owners, and the personal details (including name, address, etc.) of firearms owners are entered in a database which is available to General Public Search. I don't know if this bill will ever be enacted in Minnesota; it's enough that their elected representatives have the unmitigated gall to propose a bill which provides no safety or other benefits to their voters, and still manages to increase their vulnerability to violent crime. I've often suggested that many politicians were crooks at heart, but this is the first time we have had confirmation that they are enablers of Home Invasions. Of course, there are no practical measures which an individual may use to protect himself against his on state Legislature ... except the vote. Oh, and Minnesota is a Democratic state ... you don't even have to be an American Citizen to vote. So ... forget that; there are probably more illegal aliens that natural born citizens in your state (and mine) already. In case my friends and neighbors are feeling comfortable saying "It Could Never Happen Here"? I live in Oregon. Oregon is a Democratic State. Democrats are like rats in the woodwork; they pop up without warning, they defile their environment and eat the wiring until it shorts out and the house burns down. Then it's not fit to live in for anyone but more rats. Okay, maybe I've taken the analogy too far. But what if I'm not wrong? They used our tax money to hide the truth of their research? Well, of course they did; the results didn't fit their political goals! This is contrary to CDC's earlier reportage, which strongly suggested that firearms were rarely used in legitimate self defense, and in fact were most often used by felons during commission of a crime. Given that anti-gun people have criticized the NRA for insisting that tax money should not be used to pay for CDC's biased reporting of firearms usage, the new revelations appear to affirm that the National Rifle Association was completely in the right, and the Center for Disease Control was completely in the wrong. This revelation tarnishes the reputation of a federal agency whose legitimacy and reliability will forever be questioned; everyone knows that a proven liar can never be trusted again.